A student walks past one of the LCD screens in the Watt center. CLEMSON — Planar, a Leyard company and global leader in display and digital signage technology, has become the first Sustaining Innovation Partner for Clemson University’s Watt Family Innovation Center with a gift-in-kind of more than $1 million worth of cutting-edge display technology. The newly combined company supplied the Watt Center with 191 large-format, high-resolution interactive LCD displays and 12 LCD video walls, including the video wall in the auditorium. It is one of the largest interactive LCD video walls the company has implemented. Planar displays are front and center in the building’s ultra-modern main lobby. Each classroom, hallway and study space throughout the building features Planar LCD displays that can be used by students and teachers for formal or spontaneous collaboration. The Watt Center, a cutting-edge, highly flexible facility in the center of campus behind R.M. Cooper Library, was designed to be an innovative hub where students, faculty and industry partners will collaborate, create, innovate and communicate using state-of-the-art technology and interactive learning systems. Saadiqa Kumanyika, a lecturer teaching Women in Global Perspective, works with one of the classroom touch screens provided by Planar. Planar designs and manufactures display and digital signage solutions, including video walls, large-format LCD displays, interactive displays and other display solutions for large-scale data visualization. The company, headquartered in Oregon, is a wholly owned subsidiary of Leyard Optoelectronic Co. Ltd. 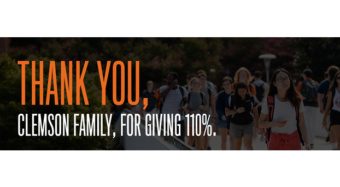 The Planar gift is part of Clemson University’s The Will to Lead capital campaign, which was launched in 2006 in support of students, faculty, facilities and engaged learning. The campaign surpassed the goal of $1 billion in July, becoming the largest higher education fundraising effort in South Carolina.